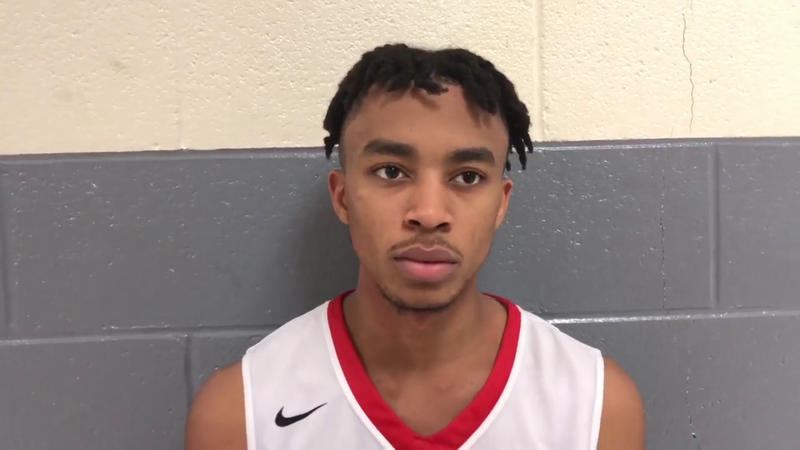 North Johnston junior Justin Vann shares his thoughts after dropping 24 points and dishing seven assists to earn the Panthers their first win of 2019 versus Beddingfield at home, 73-72. Beddingfield's Javon Best (13) goes up for a layup as North Johnston's Savon Foye contests in the first quarter of the 2-A Eastern Plains Conference matchup in Kenly Friday night. Best finished with seven points in the 73-72 loss. North Johnston's Daylan Hinnant (10) goes up for a layup as Beddingfield's Mike Best (2) tries to stop him in the second half of the 2-A Eastern Plains Conference matchup Friday night in Kenly. Hinnant hit three 3-pointers in the 73-72 win. Beddingfield's Devin Roesch (4) is blocked by North Johnston's Raekwon Rodrigues in the first half of the 2-A Eastern Plains Conference matchup in Kenly on Friday night. Beddingfield's Reggie Grant (22) lines up to shoot the ball in the first half of the 2-A Eastern Plains Conference matchup in Kenly on Friday night. KENLY — With the weight of an eight-game losing streak holding it down, the North Johnston High varsity boys basketball team loaded up Justin Vann and asked him to carry them past 2-A Eastern Plains Conference foe Beddingfield High Friday night at home. Vann delivered with 24 points and seven assists and the Panthers escaped 73-72 for their first win in conference play and 2019. With the Panthers down 53-51 with 20 seconds left in the third quarter, Vann stole a pass and laid it up to even up the score at 53 heading into the final period. The junior guard would score or assist on the next 13 points for North Johnston. The Bruins, who led 37-31 at half, went cold in the fourth quarter as they couldn’t make a 3-pointer to combat the Panthers’ inside scoring approach. But the Bruins did get a big lift from 5-foot-10, 230-pound sophomore Raekwon Batts, who finished with 19 points, including seven in the fourth quarter. The Panthers (6-12, 1-5 EPC) also had Savon Foye and Luke York finish in double digits with 15 points and 10 points, respectively. Foye also pulled down 14 rebounds. The Bruins (7-11, 3-3 EPC) had four other players score in double figures. Beddingfield got a nice boost from Lamont Speight who put in 11 points for the game and six in the fourth quarter before fouling out. Andrew Gattis knocked in three 3-pointers for 11 points. Mike Best and Trevon Brantley both dropped in 10 points. For the Bruins, it was a setback in the conference, but one that could be afforded as the two teams tied with them, Nash Central and Southwest Edgecombe, also lost Friday night. This first win for the Panthers keeps them alive in the hunt for one of the coveted four spots to keep a team alive in the playoff hunt. Beddingfield will host North Pitt (7-13, 2-4 EPC) on Tuesday at 8 p.m. North Johnston will host Farmville Central, the top-ranked 2-A team by Maxpreps.com, on Tueday at 7:30 p.m.
Brantley 10, M. Best 10, Roesch 4, Speight 11, J. Best 7, Gattis 11, Batts 19. Vann 24, Hinnant 9, Tinsley 8, York 10, Foye 15, Lucas 5, Rodrigues 2.